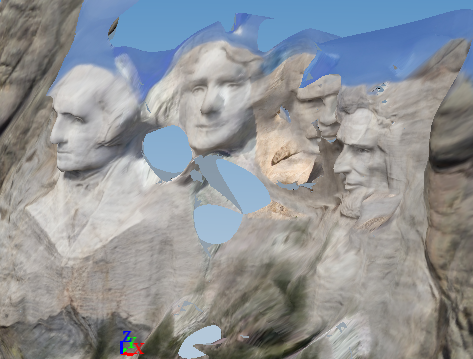 One of my first posts here was about the creation of 3D photorealistic models using tourists’ photographs, the main aim of which is the possibility of recreating monuments that were around since the invention of photography and that have since been destroyed or damaged. Also, it is a way of testing the size limits of the technology, which previous work has pushed as far as 10 m by 10 m with relative accuracy using aerial photographs. In the other post I attempted to create a model of the Sphinx, using images I had found online with a simple Google search. I had used more than 200 images, with some interesting results. Although far from complete I managed to create slightly less than half of the Sphinx, which however allowed me to draw some conclusions. The main one was that the technology is indeed capable of making large scale models from tourists’ photographs, the only issue is understanding what combination of images allows this. The images that had been stitched together (only 10% of the total) didn’t seem to follow a pattern, and a series of limitations produced no improvement. Hence I decided to move on to another model to understand what combination of photographs is needed. I therefore chose around 50 photographs of the Statue of Liberty from all angles and attempted to run them, with only 5 creating a somewhat unsuccessful mesh. Given this small number it was hard to draw any conclusions, other the suspicion that more photos can improve the quality of the model. One of the main issues I had though was actually finding photographs of all the statue. While many images of the front were available, the sides and back were practically un-photographed, and the lower part of the body was entirely ignored in some angles. Given this I moved onto another monument, Mount Rushmore. The reason for choosing this was that given it is only 180 degrees it requires less angles to photograph. 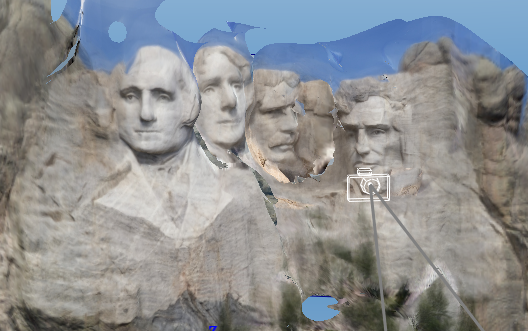 Also, the aforementioned work with aerial photography seemed to suggest that the combination of the depth of perspective of Mount Rushmore and the fact parts of it don’t cover other areas, all that would be needed is a slight variation from a single position (like in stereophotography). I selected 40 images from google search, most of which appear to be taken by the same viewing point. 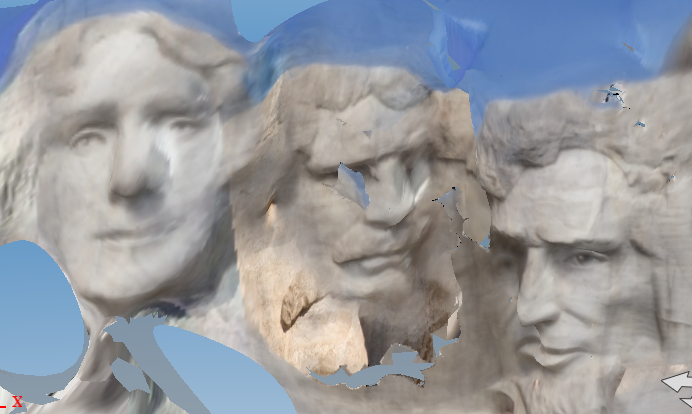 Similarly with the Sphinx, the results are not amazing, but they do narrow down the process. 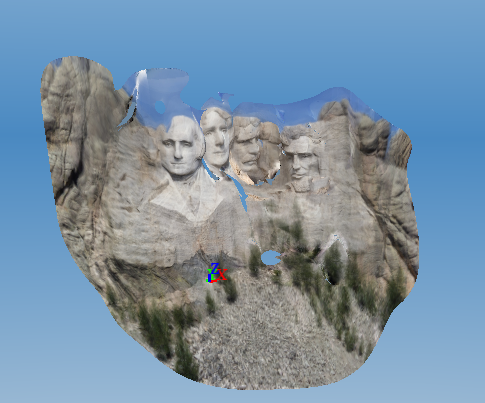 The mesh looks great from around the theoretical viewing point, but the move you rotate it the more it becomes warped and distorted, especially the faces further away. The lack of multiple images from other angles are clearly taking their toll, as the program is not managing to create the sides which become stretched. Anything that can be seen from the viewing point appears to be accurate, but the rest is much approximated. Therefore the idea of a single angle with variations has to be discarded. The good think though is that only 7 images were unstitched, while 4 were stitched incorrectly. The only reason I can see of this is the great similarity of the stitched images, which have relatively consistent lighting and colours. This therefore may be the key to the entire process, which explains why the Sphinx was harder to achieve, due to a great difference in the photographs’ colour and light. The images that were placed wrongly were taken from a greater distance than the others, which may suggest a relatively consistent distance may be another factor, and the main reason for the failing of the Statue of Liberty. Finally the fact this was done with only 40 images, over the 200 of the Sphinx shows that it is not the number that affects the model but it’s the actual image quality and consistency. The results of course are not acceptable for either of the aims of this theory, and even though I am slowly narrowing down the ideas to make this work it still requires many more tests. The next step is the creation of an Access Database to try and narrow down the key elements that may affect the results.